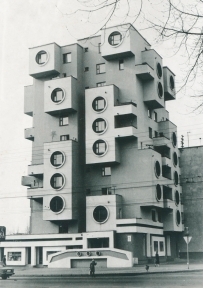 The Architekturzentrum Wien writes architectural (hi)stories: ‘Soviet Modernism 1955 – 1991. Unknown Stories’ explores, for the first time comprehensively, the architecture of the non-Russian Soviet republics completed between the late 1950s and the end of the USSR in 1991. The research and exhibition project shifts the Russian-dominated perspective and focuses attention on the architecture of Armenia, Azerbaijan, Belarus, Estonia, Georgia, Kazakhstan, Krygyzstan, Latvia, Lithuania, Moldova, Tajikistan, Turkmenistan The Ukraine and Uzbekistan.